Making organizational changes is a huge, managerial temptation. It is an effective tool for influencing employees and the favorite topic of gossip for subordinates. Leaks from the secretariat on the changes planned by the board are the reason for constant discussions, speculations and as a result of sensation. Who will lose the leadership, who will be promoted and who will be released? The closer to the deadline for implementing changes, the queues to the management cabinet are longer. Everyone wants to show off their successes and show that they deserve to do what they are doing, or maybe even get promoted! Not to mention the expected increase. And of course everyone has a few valuable comments and opinions about the quality of work of his colleagues, whom he respects but he sees evident deficiencies in their actions, and sometimes also the wrong attitude. Lack of employee preparation for changes. Lack of preparation of new goals, competences and remuneration grid. No assessment of employee competences before changes. Directing only emotions or textbook models. Pushing the organization’s key tasks to the background. Lack of awareness that each change generates costs. Changing the organizational structure only to show managerial activity or adjust the company structure to currently owned human resources is the most common mistake. The organizational structure should be a response to the strategic goals set for the company. The organizational model does not have to be fully implemented immediately. 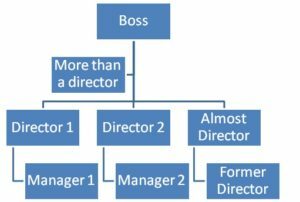 Achieving the target organizational structure with all its personal and procedural functionalities can be divided into stages. Meanwhile, managers most often decide on changes that will allow them to immediately assign people to specific positions and tasks. The disadvantage of such a concept of action is the closure of the same catalog of competencies held by the entire organization. In addition to changing job titles and perhaps some procedures, the organization will continue to do the same because the same employees will perform the same tasks only in a different place. 2. Lack of employee preparation for changes. A common method of implementing organizational changes is the „quick cut” method. One day you come to work and you see in the inbox a message with the title „New organization chart and tasks”. If you are a middle and senior manager, then this message should not come as a surprise to you. However, if for the first time you find out about your new position in the company and the new challenges you have been faced with, this can be disturbing. The consequences of this surprise on the scale of the whole organization are negative. Many people will be satisfied, but a significant number of employees will also be disappointed. So we have a quickly communicated and „implemented” new structure in which managers will work with the feeling that they have been treated objectively. In addition, they were unable to properly prepare their teams for the upcoming changes in the work system. 3. Lack of preparation of new goals, competences and remuneration grid. The most frustrating for subordinates is the lack of purposefulness of changes. Of course, there will always be malcontents who contest any, even justified and best prepared changes. However, for sure the company’s reorganization just for „making something happen” will result in a decrease in the authority of the board, and in many situations will contribute to a decrease in work efficiency. An unwanted effect may also be a mess in the division of tasks and responsibilities caused by the new course of dependence lines in the pattern of links between organizational cells. Managers should remember that changing the business subordination does not automatically transfer the goals and tasks assigned to the position. Employees are accustomed to a specific division of competences because for months, and sometimes for years, they learn what to do in the company. In addition, clients are accustomed to the fact that the processes in the organization run in a specific way and are responsible for specific persons. A sudden change strongly violates the common paths followed by employees and their internal and external clients. What’s worse, badly programmed changes will never be fully implemented and employees will gradually rebuild previous routes, returning to old habits. Therefore, an organizational caricature will be created that is characterized by an organizational scheme that does not suit the processes being carried out. You also can not forget about your pay. Managers often share examples of bad practices in the field. Degraded managers earn more than their current supervisors, new employees receive a much higher salary than their experienced colleagues, and wage differences at the same level sometimes amount to more than 40%. The pay grid must be well prepared. essentially overlap with the first three managerial mistakes characteristic of poor change implementation processes. Introducing changes without assessing one’s own human potential is like disarming an explosive with closed eyes. There is a significant risk of detonation of the main processes in the company if the wrong people receive tasks that are not suited to their competences. While sticking to military terminology, it should be emphasized that you can not win every battle using the same patterns. Implementation of changes in each company looks different, because other people work in it, there are differences in work culture, targeting models, and external conditions (suppliers, customers, etc.). You need to get to know the internal relations in the company and then plan step by step the appropriate, individually tailored change strategy. Another problem is excessive concentration on changes. Excessively focusing on the goal of change and striving at achieving it at all costs can paralyze the main processes in the organization and, as a result, reduce its effectiveness. As a consequence, new goals will not be achieved and the company will deteriorate its market condition. The last mistake should be understood in two ways. Lack of awareness that each change generates costs causes that managers either give up on fear of the state of finances, or try to minimize the budget, which does not give a chance to fully implement new solutions. Well-implemented changes are based on the PM method, which predicts costs and accurately indicates them. At the same time, the benefit from the implemented changes should be shown in the right perspective. Organizational change is therefore an investment aimed at increasing labor economics and improving the efficiency of key processes. The adoption of such an approach should increase the chances of effective implementation of organizational changes and improvement of the situation of all internal and external clients of the company.